Fitness is a major trend in this day and age. There is more awareness about the tremendous benefits people can get, and it has also become essential mainly because almost all of us lead very hectic and stressful lives. Fortunately, there are a ton of equipment that can help you with your fitness journey, and one of the most important is the weighing scale. That is why we are going to review three of the best scale for weight loss. A weighing scale is a must-have item when it comes to monitoring how much progress you have made on your path to being fit. Back in the day, weighing scales were very basic. They were manual in nature and in several cases, they were not even the most accurate. As technology advanced, so did the weighing scales. Today, they come packed with a ton of features. Most new-age weighing scales are digital and are capable of not only displaying your weight but several other factors such as your BMI. The three weighing scales that we have picked will be reviewed thoroughly for you to be able to compare each one of them and select the one that will meet your needs and wants. 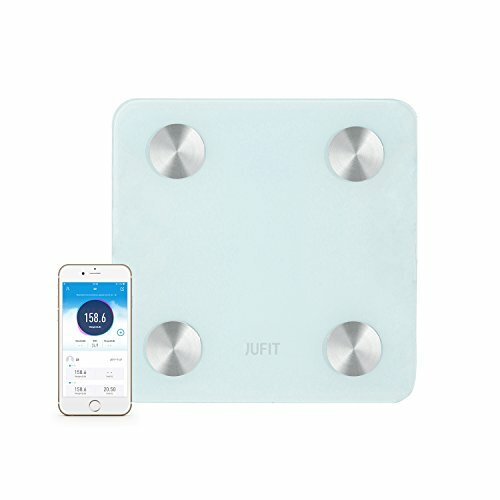 If you are into being fit and need a good weighing scale without breaking the bank, then the Jufit Digital weighing scale is a perfect choice. This weighing scale can measure weight up to 400 pounds and can also display results in kilograms. The main reason why it can withstand so much weight is that the manufacturer had used high-quality tempered glass. This glass is six-millimeter thick and is impact resistant. Likewise, in order to offer you with accurate results, this weighing scale has been equipped with four sensitive electrodes along with high-precision sensors. In addition to all of these, there is also an automatic calibration system. This weighing scale comes integrated with Bluetooth 4.0 technology, and in order for it to work, all you just need to do is download the OKOK app, which is free for iOS and Android. This app will measure and track all of your fitness progress, instead of you writing it down on a notepad. This weighing scale also comes integrated with BIA technology which is responsible for testing eight bodily measurements. Such includes BMI, BMR, body fat, total body and water weight, muscle and bone mass, and visceral fat. Measuring such will ensure that all the results displayed on the screen are almost 100% accurate. This product measures 11 by 11 inches and works using four, 6V AAA-sized batteries. It comes with a three-inch invisible LCD screen that works in any lighting conditions. 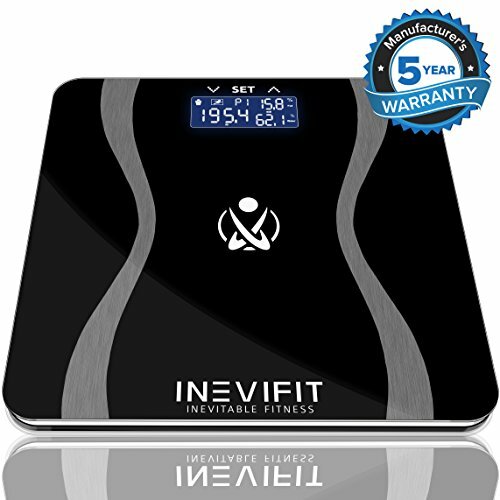 The Inevifit weighing scale takes checking weight to a whole different level. Created and targeted specifically to fitness enthusiasts, this weighing scale is an ideal product to monitor your fitness progress. This weighing scale is capable of measuring and monitoring several body composition values that include your BMI and BMR, body fat percentage, body water weight, and bone and muscle mass. Keeping track of all of which will help you better your physical health and keep everything in check. When you first use this weighing scale, you will need to set up your user profile, and once that is done, this weighing scale will recognize you automatically during subsequent use. The great thing is that this product can be used by the whole family as it can create and save up to ten users and track each of their progress. The product’s dimensions are 12.5 by 12.5 inches, and it weighs just three pounds. It is capable of measuring weight up to 400 pounds. There is a well-lit 3.6-inch LCD screen that displays all of the results. It works on four, AAA-sized batteries which come included and in order to save battery power, there is an auto on-or-off feature. Like the previous two on the list, the Marktech Weighing Scale is capable of accurately measuring not just your weight but also your BMI, BMR, muscle and lean mass, and body and visceral fat. It can also track the progress you make. Unlike most weighing scales that have four electrode areas, the company takes absolute pride in their advanced ITO-coating technology, making it capable of always offering its users with 100% accurate results. Additionally, it has an intelligent chip along with a highly sensitive G type sensor. These are responsible for ensuring that the fat rate always worked out precisely. 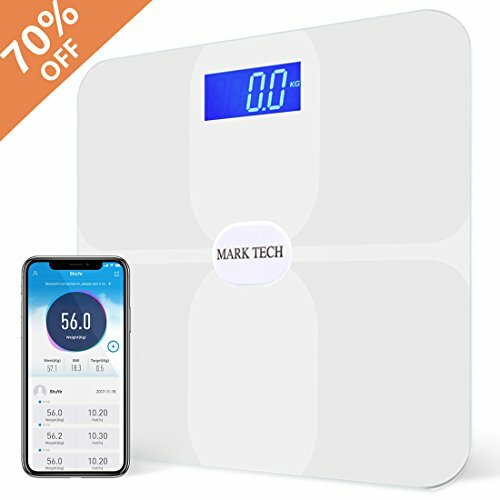 This weighing scale comes with a 4.0 Bluetooth technology, and this connects with your phone with the help of their free app for iOS and Android. This app will help you track all of the progress and can be used by even your family members as it can save up to eight profiles. The weighing scale is capable of measuring weight up to 396 pounds, and its dimensions are 11.81 by 11.81 inches. It can also read the results in kg or st:lb. For it to work, you will need four, AAA-sized batteries. Further, the product is highly durable because it is made out an explosion-proof tempered glass which is six-millimeter thick. This glass can withstand any fall or thud. The app can help track the fitness progress for up to eight users. We can assure you that these three are the best scale for weight loss on the market right now. Each of them offers accurate results and will be a perfect product for your fitness journey. Having said that, between the three of them, we would recommend the Marktech Smart Bluetooth Digital Weight Scale. 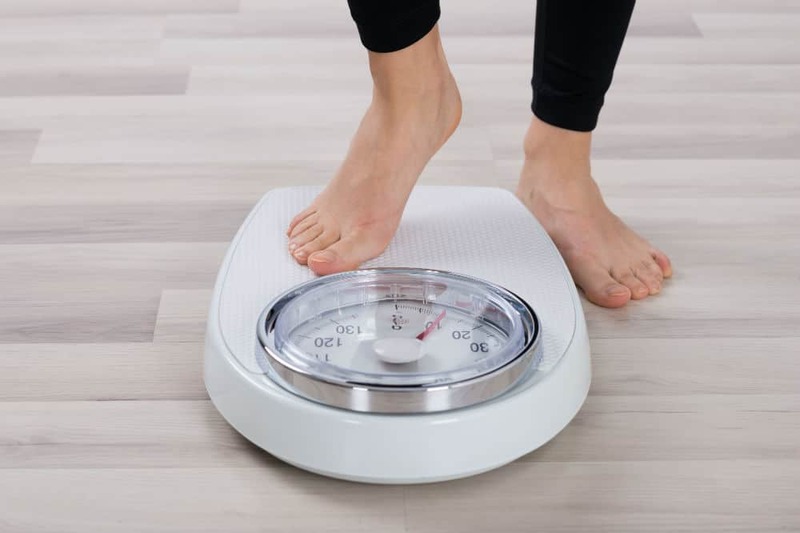 This scale is made out of high-quality and durable materials along with Bluetooth technology and an app which can help monitor the progress of eight users.